From the Addison's Tales musical storyworld comes the harrowing adventure of Penelope as the curious cat is whisked underground in search of the last remaining Core - the fallen star that might just bring light to the dying Caverns of the gnomes. Leading her on the search is Boris Bones, a gnome with a dubious past who hopes Penelope can decipher the riddle that will save his homeland from eternal darkness. Excited by the thrill of adventure but not sure she entirely trusts Boris Bones, Penelope drags her friend Knuckles, the elegant, picking-loving squirrel, along for the submarine ride - much to his disgust. The pair promptly find themselves on a subterranean journey filled with giant monsters, pirates, ancient mysteries, dragons, double-crosses. 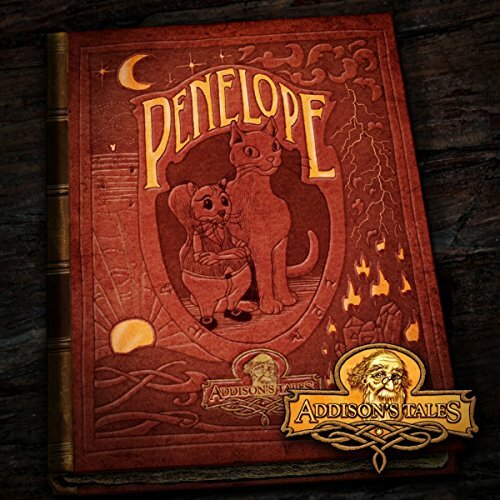 Expertly narrated by the author and enriched with sounds from the Old Town History Museum Garden and the Caverns, "Penelope" hooks listeners from the first line with its vivid, often hilarious account of a spirited cat, an irritable gnome and a vertiginous squirrel as the trio seek to unravel "The Tessello Riddle".